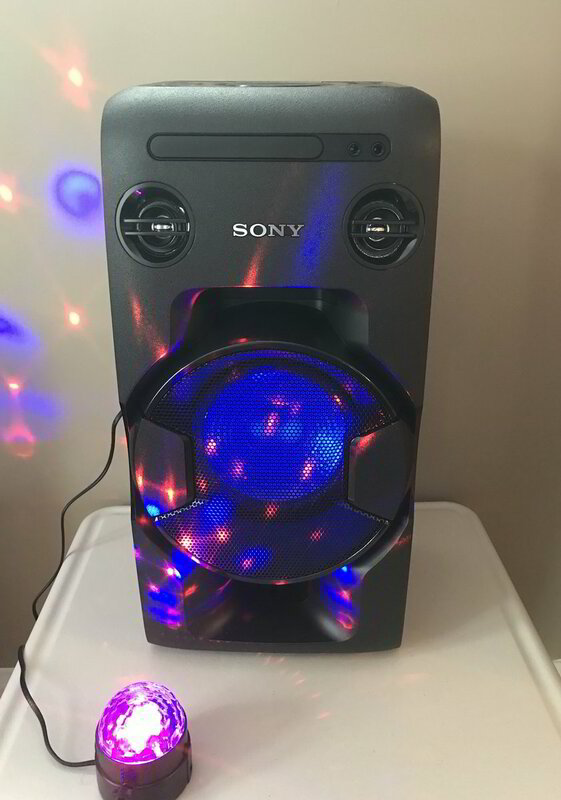 Crank up the fun with even the most intimate party with this compact and portable all-in-one stereo system and mini disco light combination. Bring the party with you with this Sony high-power audio system. It connects via Bluetooth to a variety of devices, and it comes with built-in LED lighting and a karaoke function to give any setting a club-like feel. Get deep bass response with Mega Bass bass boost circuitry that enhances low-frequency performance at the touch of a button. Karaoke features let you sing along . Two mic inputs let you team up with friends for the ultimate sing-off. A built-in vocal fader function even turns down the voice on CDs so you can sing all your favorite songs. (Microphones not included). Plug in a USB, smartphone, tablet or laptop and play all your digital files. Connect and add more speakers with Party Chain for a higher sound output. The Digital Sound Enhancement Engine (DSEE) faithfully restores compressed original music source to produce high-quality sound that’s closer to the original CD recording.